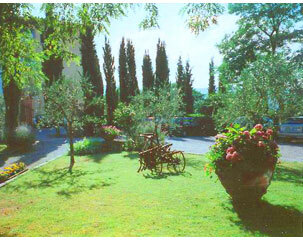 Seven nights at the villa, double occupancy. Seven breakfasts and seven four course gourmet dinners. Daily morning and afternoon group workshop instruction, lecture and demonstration. Individualized instruction to adapt to your needs. Return trip to Rome airport. The package includes one workshop: Painting, Ceramics, Cooking or Yoga. 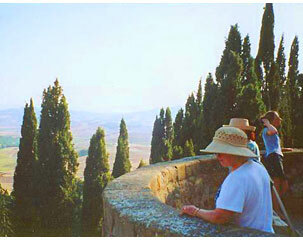 All day excursions by motor coach to Siena and Florence. Use of stools, studio space, tables and easels. Lunch is available at the villa's restaurant. 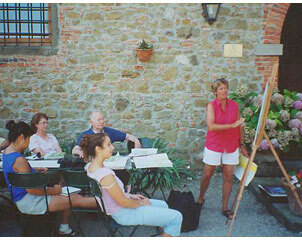 Italian Language Lessons are available at a nominal fee. Please make check payable to "TUSCANY 2000"
Please note that the maximum class capacity is 21 and these spaces do fill quickly. EARLY REGISTRATION IS HIGHLY RECOMMENDED. Copyright © 2000-2017 Tuscany 2000 Art & Culture Workshops. All rights reserved.